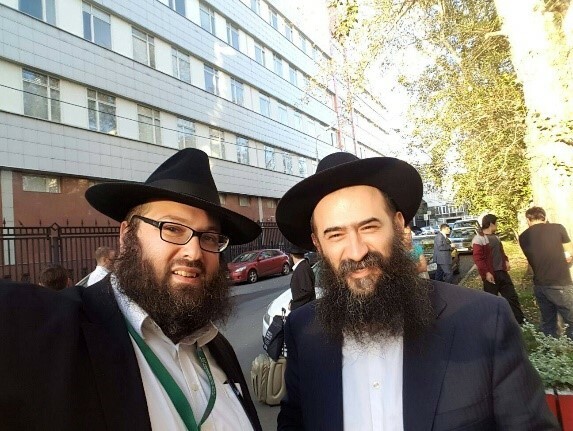 We have just arrived back from a most inspiring week with 500 fellow shluchim from around Europe travelling together to in Moscow, Lubavitch, Liozna, Liadi and Almaty. This was the European Conference of Chabad Lubavitch Shluchim from 40 countries around Europe and the former USSR. This was far more than a conference - it was probably one of the most inspiring weeks of my life, and I thought I'd share some of that inspiration with you. Our first stop was the village of Lubavitch. 8 hours' drive from Moscow. Tucked away on the western edge of Russia, on its border with Belarus, it is perhaps surprising that such a tiny settlement gives its name to the largest and most well-known Jewish movement in the world. The tradition is that the village was founded by a special Jew who excelled in love and compassion for all. It was a love for all born out of a deep love for G-d, which means that we respect and care for all of His creations. He sought to inculcate these values in others and he therefore named his new settlement Lubavitch, which means City of Love. Indeed, we are told that this village was exemplary for its love and compassion. Everyone got along and cared for each other, Jew and non-Jew. This love and care extended to all of G-d's creations, including animals. It is no coincidence that it became the home, and the name, of a movement which is synonymous with this idea: an intense love for G-d, which leads to love for all of His creations. It is this idea that lies at the heart of Chabad Lubavitch teachings. It is what lies behind the Rebbe's vision of a global network of kindness, love and compassion, a message spread by his emissaries and taken up by every person. We visited the birthplaces of Chabad, two towns in Belarusm, Liozhna and Liadi, only greeted by a police and military roadblock, both Russian and Belarusian. It turns out that - due to a law only "discovered" that morning by Authorities - permission to cross the internal border had been denied. An hour passed. Our colleague, the Chief Rabbi of Russia, was on the phone the entire time, speaking to very high level contacts in the President's office, to no avail. The answer was “Nyet”. The rest of us prayed Mincha in large groups, we sang, we danced and we engaged with each other with friendship and love, very deliberately, knowing as we do the power of love and friendship. Another hour passed. It was not looking hopeful. I asked the Chief Rabbi for an update and he answered rather dejectedly. To have such a challenge for such petty reasons made it obvious that this visit was indeed of vital spiritual importance. We doubled down on our efforts. People took upon themselves positive resolutions. People who had minor disagreements with others reached out to resolve them. Suddenly, miraculously, we were told to board the coaches as we would be crossing the border and travelling to Liozna. After returning to Moscow, we flew together to Almaty, Kazakhstan. The Rebbe's father, Rabbi Levi Yitzchak Schneerson, Chief Rabbi of Yekatrineslav in the 1920s, was exiled to a Kazakh village, as punishment for his steadfast commitment to Judaism. Toward the end of his sentence, he was moved to Almaty, where he passed away thousands of miles from home, not far from the Chinese border. There was no Jewish cemetery, but with no choice that's where he was buried. Wednesday was his Yahrtzeit and we went to pay our respects. Words can’t describe how painful it was to be there imagining the conditions they must have endured. But none of this was the real take-away from our trip. This must have been painful, but it's what is happening today that is the real inspiration. The Jewish life today in the former USSR is booming. Moscow has more synagogues than ever. From schools to state of the art medical centres and cutting edge Museums. The vibrancy is something unmatched - you would not believe it until you see it. For example: The six people who had a bris while we were there (including a 13 year old child who travelled hours to meet us across the border). Such dedication to Hashem and Judaism even with only a little knowledge, was humbling and inspiring. To imagine that only 30 years ago the mere mention of the name "Schneerson" would land you in jail in the USSR, to see the terrible conditions in which the Rebbe's father passed away in Almaty, and now to witness the unprecedented growth of the Rebbe's work in Russia today is just miraculous. Before the closing banquet, we had a group picture. At this point, one of my Russian colleagues came over to a fellow shliach from France, and asked "Do you recognise me?" The French rabbi had a blank look. "We were together in a Chabad Camp in Russia 23 years ago" his colleague said, "I was not religious, you gave me a siddur and I carry it until today. I was so inspired by that summer, I followed in your footsteps and now lead a community of my own.